The kids of your fears are your tears. Hate is straight. 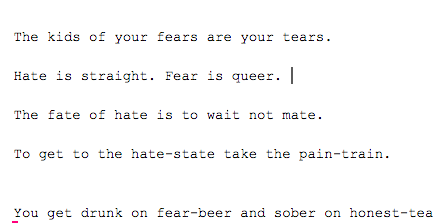 Fear is queer. The fate of hate is to wait not mate. To get to the hate-state take the pain-train. This entry was posted in nothing by nobody, Novel, Poetry, Short Story and tagged nothing by nobody on May 7, 2017 by Ideas With Ink.